Boise State first implemented TINT on the jumbotron at Albertson Football Stadium. 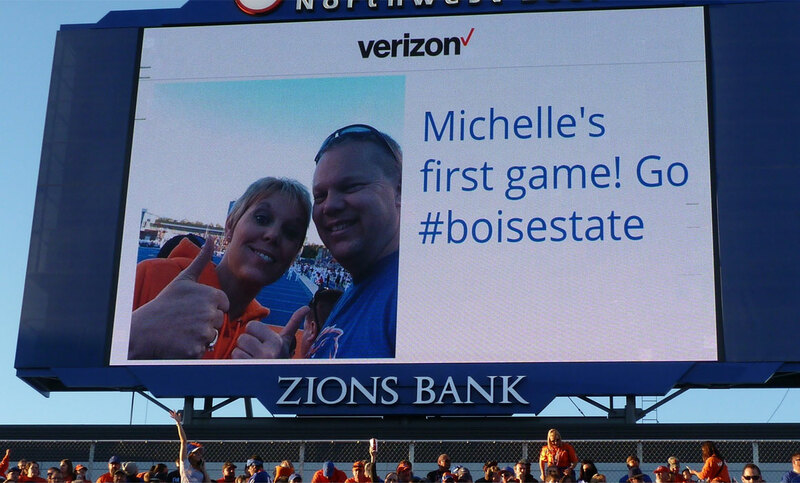 As fans posted selfies and fun game-time moments on the #BoiseState hashtag, select posts appeared on the jumbotron in real-time. Fans loved seeing themselves on the large screen - even those who did not attend the event could be featured, and it generated a lot of excitement during the game. For the Athletics Marketing Team, they loved that they could easily moderate the entire conversation through TINT’s moderation app. Initially, it took a couple days to get the content to display properly on the jumbotron which works a bit differently than traditional screens. Since then, TINT has worked perfectly. Today TINT’s technology is used on Boise State’s website, at campus events, and more to illustrate the Boise State experience in real-time. It is the technological solution that Wendy Fox, Digital Communications in the Office of Communications and Marketing, uses to encourage students, campus partners, community members, and beyond to join the conversation. Boise State is using TINT to display social content on their website. They like to share all kinds of live content created by students, alumni, and faculty and pull it into different pages depending on the topic, hashtag, or users. Unlike sporting events where it’s best to see the TINT live, anyone with internet access can see the TINTs on your site! Boise State has a dedicated “social media TINT” webpage. This TINT displays social content in real-time from the hashtag #BoiseState from key platforms like Facebook, Twitter, and Instagram to highlight social conversations happening around the school. Boise State pulls in content from the #BroncoShopping hashtag and includes “Shop This Look” call-to-actions on a TINT on their homepage. Boise State even puts a TINT on their About Page! Boise State still uses TINT on their jumbotron at Albertson Football Stadium, and now also on the jumbotron at Taco Bell Arena where basketball games and other events are held. The in-stadium TINTs are moderated by the Athletics Marketing team, and the university engages behind the scenes with fans by liking their content to let them know that their content has been seen (since not every post makes it onto the Jumbotron). The Marketing team will also retweet/gram key moments with permission. Boise State integrated TINT into video walls in their Student Union. They routinely see people taking “selfies of their selfies” on the video wall when they’re walking thru and their pic pops up all driving further use of their hashtags and social sharing on campus! Boise State also uses TINT at campus events like Bronco Welcome, Homecoming, Spring Fling and New Student Orientations throughout the summer in addition to student-driven fundraising events for the Children’s Miracle Network and American Cancer Society. These are managed and moderated by a variety of campus partners like Student Affairs, New Student Programs, Orientation and Admissions staff in collaboration with Communications and Marketing. Boise State recently started incorporating TINT into its recruiting efforts. Some of the events where TINT was used include Discover Day, Bronco Day, showcase receptions, admitted student receptions, and grad fest events. At Bronco Day, Boise State’s largest student recruiting on campus event, The #BroncoDay hashtag was placed on all marketing materials and drove a ton of engagement and traffic. This year, Boise State used TINT’s new “Tag-of-War” feature to generate social buzz before the Bronco Day event. Tag-of-War uses keyword filtering to display content of two rival hashtags separately on the same screen. Each potential student receives a Bronco team color, orange or blue, to determine how their posts will be counted. This year, Bronco Day had over three thousand potential students and their guests attend the on-campus event. And, using tag-of-war had a dual effect of increasing activity in #BroncoDay and #BoiseState hashtags! TINT is also embedded on Admitted Students web pages and pulls in content from #officialbronco, #visitboisestate, and #boisestate hashtags. With the different themes that TINT offers, Boise State also uses TINT as a Q&A platform for Admissions to run engaging information sessions where students tweet in their questions and they get displayed in a TINT. Engagement on Boise State’s social platforms has rapidly grown since they signed up with TINT. Fans love seeing themselves featured and the chance of instant fame makes posting even more exciting! With TINT Analytics Boise State can easily see increases in impressions, shares, and posts, and when and where those swells are happening. For instance, Boise State saw a 300M impression surge on the #BoiseState hashtag during a highly-anticipated football matchup with Washington State. Later that season, Boise State had their largest social sharing surge during the game against Virginia generating 407 million impressions and surpassing the Washington game sharing peak. Being able to compare data through the TINT Analytics platform tells Wendy and the Communications team what people are excited about and helps them plan for the future. Surprisingly, it has been pivotal not only on the display side, but also on the listening side. For instance, Wendy enjoys using TINT on the back-end as a listening tool to see content for specific hashtags as well as using the geolocation feed options to get a clear sense of what people are sharing and what is going on around campus. Due to the increasing display capabilities of TINT’s technology, Boise State can use content from an event and put it on their website in different ways for new audiences, and is what Boise State really loves about TINT - that there are real-time and long-tail effects that touches all of their online communication channels. As user-generated content is immediately featured on display screens, the audience is encouraged to share fast and often. Wendy continues to find more ways to use TINT and increase the use of their hashtags, like #BoiseState, and this has been such a success so the fun, liveliness, and spirit of their school is shared with those who are not on campus! “It is easy to add users, easy to moderate - with all the granular user permissions we can let students moderate without touching anything else - TINT's solution lets us have a range of control with the sharing!" Overall TINT offers Boise State a broad view of the engagement during major events and can see that both #BoiseState and the words, “boise state” are being used in some tremendous ways. They love to reflect that back internally and to the university’s leadership. For Wendy and the Boise State Marketing and Communications team, the combination of fresh content, analytics, and an easy-to-use system is hard to beat. Special thank you to Wendy Fox and the Boise State Communication Team for letting us interview them about their TINT experience and being part of this case study.